So the wife may or may not of ran her 2018 Subaru out of gas yesterday. I am not allowed to say definitively lol. 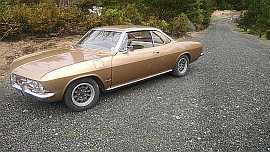 At any rate I gave her my truck to drive and I pulled the corvair out to get gas and then eventually drive to work. THe ambient temp was around the 30F mark. It was evident I have never driven or tuned it below freezing. It originally did not want to start. A couple adjustments to the EFI and it popped off. After driving in below Freezing temps I had a couple questions. 2. I left the laptop hooked up. My exhaust flappers are wide open as I have no bellows. In the summer I regulate warm up with EFI settings. I noticed yesterday. The engine ran about 167F going down the road and would almost hit 200 standing still for 4-5 minutes. So I imagine in the winter the flappers are kind of important. In the summer operating temp is about 235 a little lower if I am cruising. 3. The trans and rear end seemed to work well, but when I let off the gas there was definitely a bit more drag. I am assuming the differential oil (GL4 I think it is) is not a fan of low temps. I notice that in my 65 Sports Sedan. I can hear lots of stuff, and things come out at different RPM's as well. I think its just the nature of our beasts. Noise - Pretty Normal. Remember, even in Premium Trim, there was little to no Sound Deadening installed at the factory. Corvairs were Economy Cars, not Luxo-Barges!! Try driving a Greenbrier in base trim and you'll really think you hear every ant you run over. I thought the Cars were noisy. Wow, was I wrong! I have carpet padding and moving blankets over the back deck and a big rubber mat over the floor in the middle and it is much improved, but still much noisier than even the cheapest econo-car of today. I knew the electric would not work. Simple kilowatts to BTU conversions show that. Not enough kilowatts from the alternator to do the job. Lots of loss through steel body panels, loose seals and glass. I never expected it to be cosy. I did spend some time upgrading the electrical. It takes the edge off on a fall day. On a winter day forget it. With that said, the defrost worked great and was needed lol! I never expected my little vair to be a caddy, man have modern cars spoiled me! All this has me thinking though, I could fix many of my issues, just by getting the stock corvair heating system up and running again. I think the only component I currently own to the system though is the control panel and the exhaust shields without bellows. I have not leaked a drop of oil or exhaust in three years so I should be good for the occasional winter day with the stock system. My 64 vert is fairly noisy but the 66 I think is pretty quiet for an old car, can hear the exhaust a little but not the engine and very little road noise. It has some thick jute padding insulation in the engine bay, hood and quarter panels. Plus almost nothing rattles, Frank did a great restoration back in 1992. I've been surprised how quiet my Greenbrier Standard is. Sure it's not a limo and has a lot of wind noise but it's not as noisy as I expected it to be. The noise from the engine in EM convertibles is much more noticeable with the top up. I have driven EMs with sound deadener added and they are drastically quieter. One I drove was too quiet. I couldn't hear the engine enough to shift. Though it has been three years since I put our Corsa back on the street, I have driven it in the cold. A clean engine without oil leaks and good exhaust packings served to produce sufficient heat at 38 degrees air temp so far. I was surprised at how good the heater worked when warmed up, as it had been 20+ years between Corvairs. I replaced the original fan blower with a two speed Siemens blower motor from O'Rileys and I upgraded the fabric heater hoses to a polymer flexible rubber-like synthetic with a non-metallic helix, so if it ever rubbed the axle it would not damage the axle tubes. I do carry an aviation style carbon monoxide (CO) detector strip just in case, at couple bucks each, it is cheap insurance. 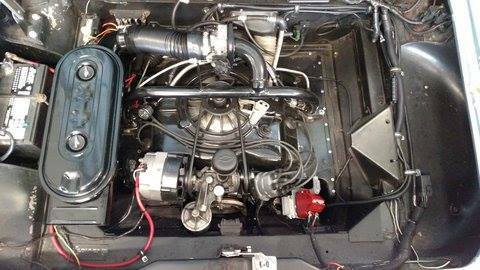 I upgraded my transaxle from 1965 4 speed/posi to 1966 4 speed and posi and it is always a bit notchy, a little worse as temps drop. Engine fan noise is always there, after all it is air cooled, my sons (30+ years) think it loud, but I like the sound of the motor. My Corsa is a pleasant cold weather ride, though I would not subject my investment driving on salted roads, I am hoping we have a mild winter in midwest. 60's cars in general... not just Vairs..
Start engine... leave on fast idle! Edited 1 time(s). Last edit at 11/09/2018 10:38AM by MattNall. > at 38 degrees air temp so far. > case, at couple bucks each, it is cheap insurance. > notchy, a little worse as temps drop. > I like the sound of the motor. Hey, drive it to the meeting Tuesday, that'll be a good test for your heater! where can I get the aviation style carbon monoxide (CO) detector strips? I drove a stock '66 coupe as my winter beater in northern Alberta. No problem starting at -40 and warmth in the passenger compartment was okay with stock lower shields and damper doors. I did have the summer/winter cover in the winter position. Have fun and keep warm. I've only driven down to about 14 degrees and a properly functioning Corvair heater will get hot enough that you have to turn it down. Be sure to seal everything up. A leaky vent door or speedo cable grommet will make it really chilly on your toes no matter how good your heater works. My turbo engine heater will cook you, no matter how cold, period and its a vert. The bad thing about turbos is carb icing when its humid and in the upper 30s to low 40. The recirculatory plate must be open or you won't get far. Never heard of these, neat idea, Corvair vendors should sell them. > must be open or you won't get far. A properly working heater system will even cook a convertible. But, on a freezing day, they will lose all heat rather quickly once it is turned off! > > must be open or you won't get far. > rather quickly once it is turned off! I had to suffer through this last week with the lower shrouds off in weather that was not nearly as cold as what you are currently seeing. The head temperature wouldn't get above 150, and the air temps were around 45-55.
run the a/f's quite a bit leaner (something like 14.5-15.5)… Not doing that again! I've got to admit though the engine sure runs smooth that lean when it is cold like that! I also need to tweak my settings for better starting in this kind of weather. Took my car out today, sunny but only 42F. Heat worked well, no complaints. Actually a pretty nice day to enjoy a Sunday drive in my Corvair! 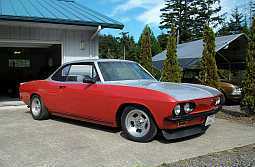 My quietest Corvair is also my best working direct air heater Corvair. 63 Rampside. 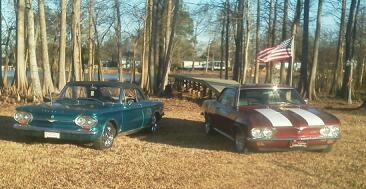 My loudest Corvair is my 62 Monza Wagon.